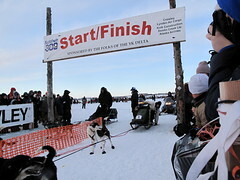 The k300 dog race is underway. The race was delayed by two days because of warm weather and freezing rain. There are open holes in the river and a lot of over flow on the river. Then on Saturday night we had wind gusts of up to 100 miles an hour as the warm air mixed with the cold air that moved in. The mushers took of at noon on Sunday. It’s a fast icy trail so we expect them in by Tuesday.